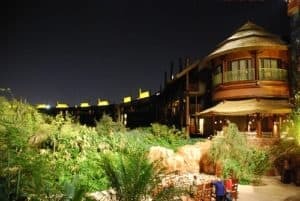 If you are looking for a very special luxury Disney World resort hotel then you really should consider Disney’s Animal Kingdom Lodge. A stay at this unique resort is definitely something very special. 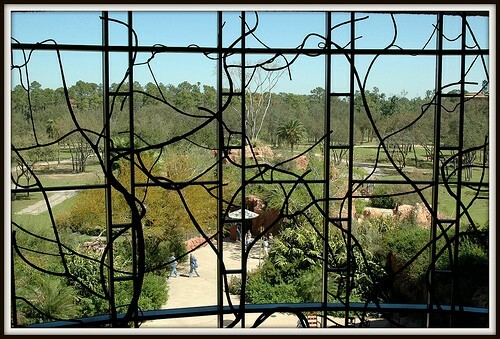 Disney’s Animal Kingdom Lodge is located adjacent to the Animal Kingdom theme park. Step inside the lobby and you will feel as though you have been transported to a luxury safari lodge on the African continent. 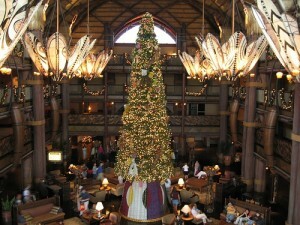 The best thing about the Disney Animal Kingdom Lodge? The wildlife! This deluxe Disney hotel is set in a 40 acre savanna where over 200 species of animals and birds roam freely. There are animals, which include giraffe, zebra, ostrich, impala and wildebeest, to be seen throughout the resort. We can’t say this enough – Disney’s Animal Kingdom Lodge is an amazing experience. If you get the chance to stay here you really should. 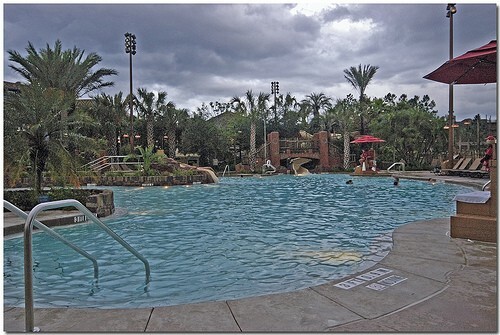 It is usually one of the more reasonably priced Disney World Hotel Deluxe resorts. If you choose a Disney Animal Kingdom Lodge Savanna view room (and you really should if you can) then you can wake up, step out on your balcony and view the giraffes. No other resort in North America offers you this unique experience. Disney’s Animal Kingdom Lodge is unique. 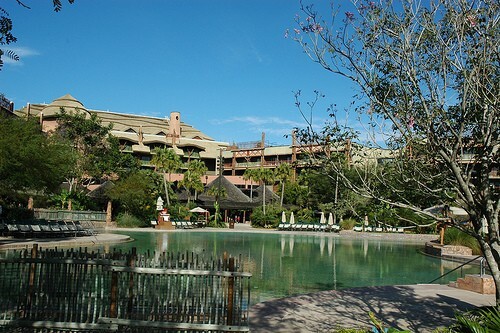 Disney’s Animal Kingdom Resort is their newest deluxe resort The hotel was built in 2001. The new Animal Kingdom Villas comprise Kidani Village and The Jambo House which offer villa style accommodation and are part of the Disney Vacation Club. However, these Animal Kingdom Villas are open for booking by all guests. You do not have to be a DVC owner to enjoy these amazing accommodations. How do you choose the best rooms in Disney’s Animal Kingdom Lodge? You kind of need to know your way around as there are some rooms which are better positioned than others. There are 1,293 guest rooms most of which are 344 square feet in size. This is not huge for a Disney World deluxe hotel, but it is larger than your average hotel room. Most Animal Kingdom Lodge Resort rooms have full balconies. The deluxe rooms are larger in size and there are some suites available. The majority of rooms are standard rooms. These are located on floors 1 to 4. Standard rooms have either 2 Queen beds, a King bed or 1 Queen and a bunk bed. There are also a number of rooms which are wheelchair accessible King rooms. Each room accommodates up to 5 people. The bunk bed rooms are a lot of fun for those with young children and are very popular. Deluxe rooms are the same configuration as the standard rooms but are larger at 381 square feet. They are located on floors 5 and 6. All deluxe rooms are concierge rooms. 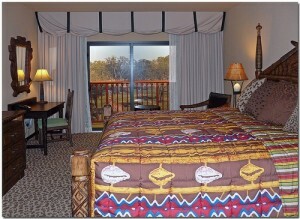 The most important thing about your choice of Animal Kingdom Lodge room is your choice of view. Usually I advise guests to think very carefully if the upgrade price of a view room in an hotel is really worth it to them. 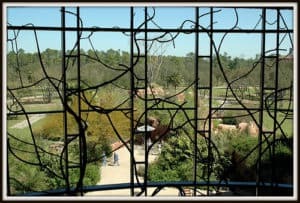 However, in the Animal Kingdom Lodge I really do think that you will get so much more out of the experience if you choose a savannah view. It is so much part of the experience that if you can afford the upgrade then go for it! There are 135 Standard View Rooms. These have a view of the parking lot and of course are the lowest priced rooms available. There are also 136 Pool View Rooms. The pool area is very attractive and beautifully landscaped. It can of course get a little noisy at busy times. The majority of the rooms, at 724, are Savanna View Rooms. Disney of course designed the building to make maximum use of the unique animal viewing opportunities at this resort. There are also 191 Deluxe Savanna View Rooms and 55 Concierge Rooms (both pool and savannah view). Should you compromise and go for a cheaper room at Disney’s Animal Kingdom Lodge? It is all about money of course. 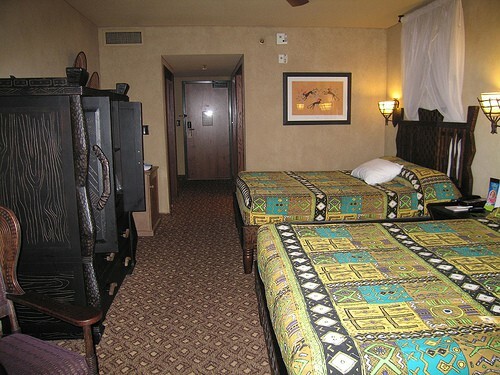 For us, we enjoy the Animal Kingdom Lodge so much we can live without a savannah room if the price is right. However, if the price difference is small then we go for the upgrade. If you really want to treat yourself then the Presidential and Vice Presidential Suites are available, as well as 5 one bedroom suites and 12 two bedroom suites. If you choose a Savanna Room then the general opinion is that the views from the 3rd and 4th floor rooms are the best. Also remember that the Lodge is set around 3 separate savannas – Sunset, Arusha and Uzima – and not all of them have the same animals. We always request the Sunset savanna as this is the only one with zebras. Fortunately all 3 of the savannas have giraffe. These truly amazing animals are visible from all areas of the resort. You can request a room located on a particular floor or savanna – but remember always that requests are not guaranteed. 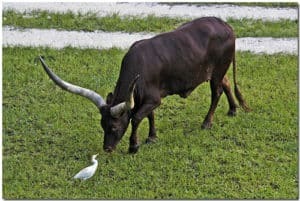 The Animal Kingdom Lodge has many viewing areas from which to see the animals – so it isn’t just those guests staying in the savanna rooms who have this privilege. There are both inside and outside viewing areas. There are comfortable rocking chairs located on outside viewing areas – a favorite place to sit back, relax and enjoy a glass of wine. This being Disney you would also expect a little magic. At night time the Savanna area lit as though it is full moon every night. The result is truly magical. How Much do Rooms Cost at Animal Kingdom Lodge? A standard view room starts from $359 per night rising to around $575 at Holiday Season. Standard Savanna view rooms start at around $508 to $772 per night. Bunk bed rooms are priced slightly higher. Deluxe pool view rooms start at $390 and rise to almost $616 a night at peak time. Deluxe savanna view rooms start priced at $360 rising to $560. Again, bunk bed rooms are higher priced. One bedroom suites rates start at $1005 to over $1556 a night. Two bedrooms range from $1698 to $2869. If you want to book the Royal Kuba Vice Presidential Suite then the price range is upwards of $3000. For the ultimate Royal Assante Presidential Suite then get your credit card ready to take some serious stress and spend some serious money. Where are the Best Rooms in Animal Kingdom Located? 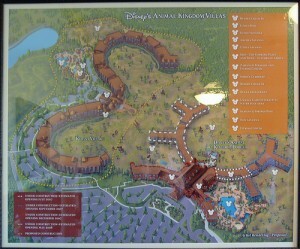 To answer this question you first need to have an idea of the resort layout of Disney’s Animal Kingdom Lodge. You will enter the resort on the 3rd Floor into the huge breathtaking lobby. The 4 guest room wings are each 5 stories high and fan out from the lobby building. Surrounding these ‘wings’ are the savannas. The Zebra Trail and Kudo Trail wings offer the most attractive and best views. The best savanna views are on the Kudo and Zebra Trails facing the interior savannas. Exterior room views are good but generally not quite so good as the interior. Pool views are offered by some of the outside facing Zebra Trail and Giraffe Trail rooms. The Ostrich Trail and Giraffe Trail rooms are perhaps the least desirable wings as well as being the smallest. Some rooms on the Ostrich Trail overlook a small Savanna but many overlook the entrance. Some Giraffe Trail rooms overlook the pool but most have a view of the entrance instead. Which floor is the best? General opinion seems to be that the 3rd and 4th floor rooms have the best views of the savanna. As the view is a very crucial part of your stay it is worth doing your research and requesting a room on a particular part of the Lodge. Requests are not guaranteed but it does cut down the risk that you will be allocated a room that you are not quite happy with. This really is something which your Disney Travel Agent can help you with. The right room can make a big difference. What does Animal Kindgom Lodge Concierge Level Offer? 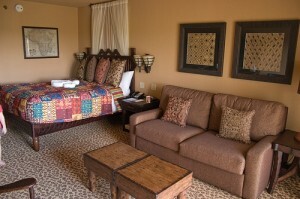 The Kilimanjaro Club lounge is for the exclusive use of concierge and suite guests at Animal Kingdom Lodge. It is located on the 5th floor of the Lodge. Strangely the resort was designed so that the lounge does not have a view of the savannas – an unusual planning quirk for Disney. You will find helpful concierge staff in The Kilimanjaro Club who can arrange tours, dining reservations and answer any questions that you may have. The Club also serves snacks and beverages throughout the day. A selection of beer and South African wine are available in the evening from 5pm to 7pm with appetizers from Boma and Jiko. The standard of the food and beverages is high and certainly well worth taking advantage of if you are staying on concierge level. In my opinion it is worth upgrading to concierge level if you can. I have stayed in many hotels both in standard and concierge level and probably the best value for the money was in Animal Kingdom Lodge. The food is excellent and it is worth it for that alone. The Animal Kingdom Lodge has one swimming pool – the Uzima Springs pool which at 11,000 square feet is the largest swimming pool at a Disney World hotel. It has a 67 foot water slide, zero depth entry and kids wading pool. There are also 2 hot tubs located away from the pool in secluded, usually quieter areas. The main pool does get very crowded at busy times and unfortunately there is no ‘quiet’ pool for those preferring a bit of relaxation. The Lodge has a fitness center. There is also a child’s playground area located near to the swimming pool. Children have an activity center – Simba’s Clubhouse. This supervised activity facility is for children aged 4 to 12 years old. Reservations can be made in advance by calling 407 WDW DINE. One of the great things about Animal Kingdom Lodge is the wide variety of activities which it offers. Some are even free like the flamingo feeding,night vision animal watching over the savanna,safari games, cookie making at Boma and music of the Savanna in the Sunset Lounge. There is plenty for all the family to enjoy – check out the daily bulletin which will be delivered to your room each day, or the posted schedule in the lobby. Bush Camp is now available to all children aged 6 to 14. This Camp runs every Saturday from 1pm to 4pm. Bush Camp offers children the opportunity to learn about African culture and the animals of the lodge through play, organized games and activities. Advance reservations are required by calling 407 WDW PLAY. The cost is $30 per child plus tax. Some of the best experience used to be reserved exclusively for concierge guests. However, Disney has now opened this up to all Animal Kingdom Lodge guests. Wanyama Safari can now be booked up to 180 days in advance by any Animal Kingdom Lodge resort guest. The Wanyama Safari departs from Porte Cochere at the Lodge every Monday, Wednesday and Friday approximately 90 minutes before sunset. This is as close to a true safari experience as you will get outside of traveling to Africa. This is an exclusive night time safari experience. At $190.64 per person it doesn’t come cheap, but it is a truly unique experience. After the safari guests will go to Jiko to experience a multi course dinner and wine pairing experience. The Wanyama Safari can only be booked by contacting the Animal Kingdom Lodge Itinerary Planning Office up to 180 days in advance. Unfortunately, the Sunrise Safari Breakfast is no longer available. Yes, it is pricey, but if you get the chance to experience it you really should. 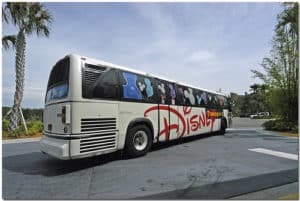 As a guest of Walt Disney World resort you will of course have access to the free transportation system which connects the parks and resorts. Want to know the main drawback to the Animal Kingdom Lodge? Location. 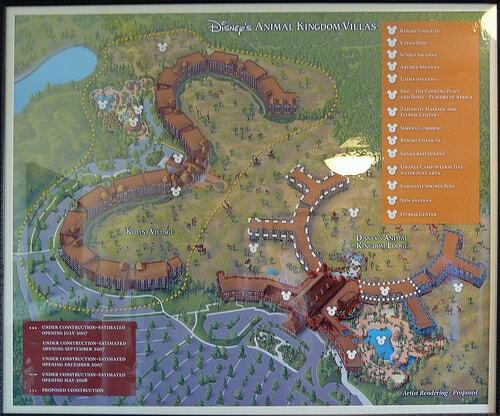 The Animal Kingdom Lodge is located right next to Disney’s Animal Kingdom. But there is no walk way so you even have to take a bus to get to the closest park. Disney transportation has 3 modes of transport: buses, boats and the monorail. 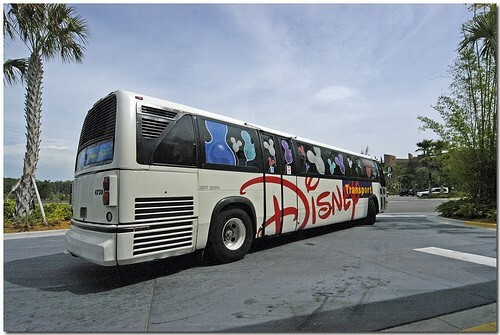 Disney’s Animal Kingdom resort is part of the bus transportation system. To be honest the buses can be slow and rather inefficient. This is the only Disney resort where I would say that a car is almost essential. You can of course use the buses. However, you may be frustrated by your journey times. 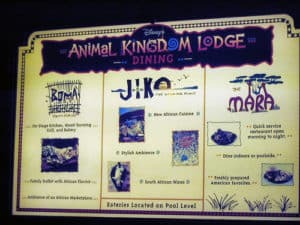 Disney’s Animal Kingdom Lodge Restaurants. This is another category in which the Lodge really excels – dining. 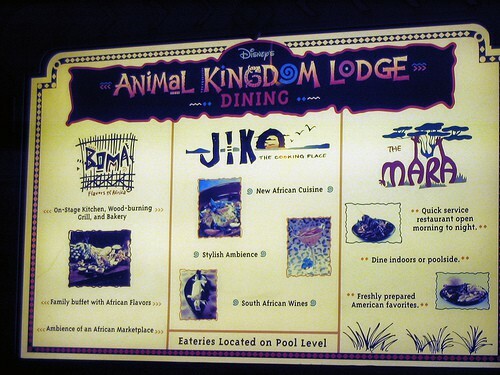 The Animal Kingdom Lodge has 2 of my very favorite Disney World restaurants – Jiko and Boma. When I first started writing about Disney I was reluctant to ever disclose my favorite Disney restaurant for fear that it would stop being the best kept secret! Unfortunately I was right to keep it quiet. This Disney World dining secret now seems to be out. Boma at Animal Kingdom Lodge has increased in popularity in recent years and it can be difficult to get a table. If you want to dine at Boma make Advance Dining Reservations by calling 407 WDW DINE. For all of you who think that you can’t have quality food at a buffet restaurant then Boma may force you to rethink. Boma serves a buffet breakfast and dinner each day. Whilst breakfast is good I would suggest dinner for a very special treat. 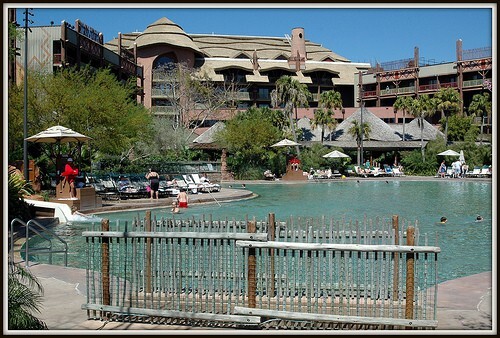 The breakfast buffet at Boma is $24.23 to $29.49 for adults and 13.71 to $19.84 (aged 3-9). Dinner is $41.33 to $47.59 for adults and $21.10 to $26.29 for children. Tax is included but a gratuity is extra. Why the price range? All Disney restaurants have seasonal pricing – the busier the parks the more the food costs. Therefore if you travel at busy times you will be paying more for your dining. The food at Boma is a little difficult to describe. It has African influences and this is a cuisine which is a little different from that we are all used to. The menu changes daily but my favorites are the soups and the couscous and the hummous dips. There is plenty of choice of hot entrees including carved meats and fresh salmon. Boma has lots of salads and fresh fruit too. For the younger members of the family there is a special buffet with the usual favorites of mac and cheese and chicken nuggets. So don’t worry that the kids won’t find anything to eat. The desserts are also a big favorite of mine. You have to try out the Zebra Domes. Jiko – The Cooking Place is a full service fine dining restaurant that is one of the very best in Walt Disney World. Jiko is a truly family friendly fine dining experience. Jiko serves dinner only in a beautiful African themed setting. The dining room is inspired by the opening scenes of Disney’s The Lion King. You will be shown to your table by an exchange program student from Africa who are at Disney as part of a year long cultural exchange program. The waiters at Jiko are exceptional and many are trained sommeliers who will help guide you around the exclusively South African wine list. The flat breads are a specialty and definitely worth trying. Entrees range from around $30 and upwards. Great options include Swahili Curry Shrimp, Maize Crusted Halibut and Oak-Grilled Filet Mignon. 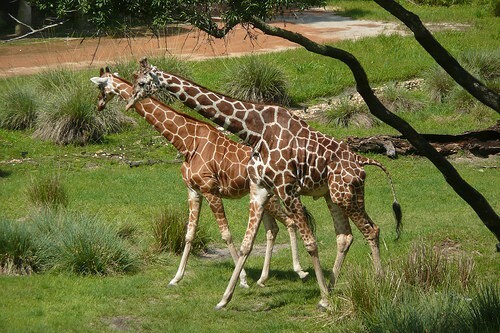 If you just need a quick snack at The Animal Kingdom Lodge then Mara is open for breakfast, lunch and dinner. This counter service restaurant offers the usual favorites – waffles, pizza and burgers. It is located just next to the pool and there is plenty of indoor and outdoor seating. 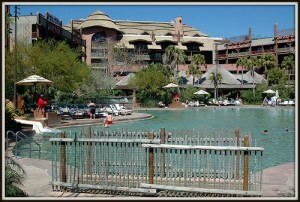 Animal Kingdom Lodge also offers Uzima Springs pool bar and Victoria Falls Lounge bar. Disney’s Animal Kingdom Lodge now offers villa accommodation in the original resort building Jamba House and the newly built Kidani Lodge. The villas are part of Disney’s Vacation Club but are open to be booked by any guests. Disney’s deluxe resort villas are a great option for guests looking for luxury spacious accommodation which offer kitchenettes or even full size kitchens with multiple bedrooms. The Disney villas can be an ideal vacation option for families in particular. They offer space and convenience in the very best Disney resorts. The main building of Disney’s Animal Kingdom Lodge, The Jambo House, is where you will find 216 villas which are located on the 5th and 6th floors of the building. There are a number of villa options in the Jambo House. Choose from a Studio, One Bedroom Villa, Two Bedroom Villa or Three Bedroom Villa. The Villas have a kitchen and the Studios have a kitchenette. The different views options are just the same as the Lodge hotel rooms with Standard (the parking lot), Pool View and Savanna all being available. Guests also have the option of Concierge Club level for the Studios and Villas. The price? Of course they vary between dates and villa types but they can be a great value if you have a larger party. Check with us for specific pricing for your dates. 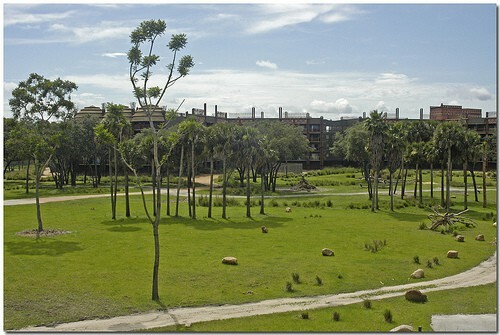 The newest villas and studios are located in the Kidani Village which has 492 new units. The choice is of Studios, One Bedroom, Two Bedroom and Three Bedroom Grand Villas. The view choices are Standard and Savanna Views. 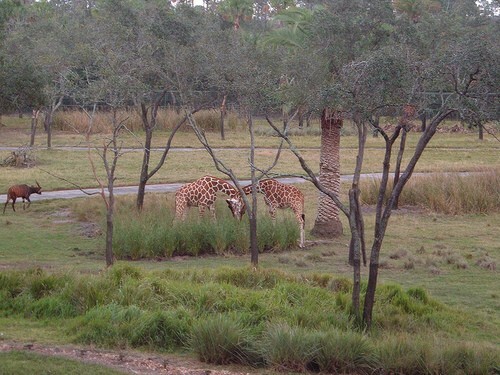 Kidani Villas is a brand new part of Disney’s Animal Kingdom and has it’s own savanna. Guests can use any of the facilities of The Animal Kingdom Lodge but Kidani Village also offers some new amenities. The Village has a 4,700 square foot zero depth entry swimming pool complete with a 128 foot water slide. Adjacent to the pool are 2 hot tubs and a new Survival of the Fittest Fitness Center. The new Uwanja Camp is a 4200 square foot interactive water play area for children and teens. You will also find a half Basketball Court, 2 Tennis Courts and a Video Arcade Center. 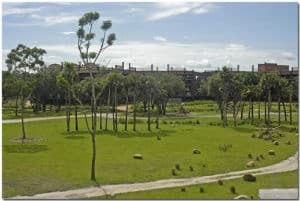 Guests of the Animal Kingdom Lodge Jambo House and Kidani Village will be able to use the facilities of both locations – you can easily walk to each part of the resort on the outdoor walking path. How Do I Know If Disney’s Animal Kingdom is the Right Choice? The best way to decide on which is the best Disney World hotel for you is to look at all the great options open to you. Disney Animal Kingdom Lodge – Which Are The Best Rooms?